In case you’re not familiar with Sigma’s Art series primes, they’re the company’s high-speed f/1.4 models that are designed to compete with the very best lenses from Canon and Nikon, and can even give legendary lens maker Zeiss a run for its money. 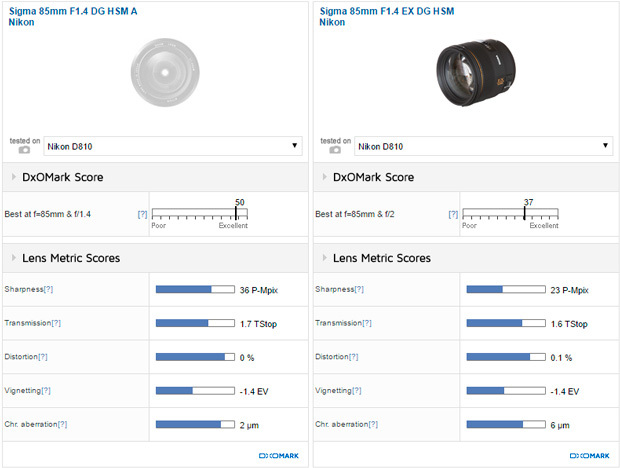 But not only does the Art series compete with the high-speed, high-grade lenses, Sigma’s pricing model is usually competitive enough to tempt those considering the other brands’ lower-end models. This new lens isn’t as inexpensive as the earlier models in the range. At around $1199, it’s a good 25% above the $899-$949 typically asked for those lenses. However, the 85mm F1.4 is considerably larger than any Art prime that preceded it from Sigma’s rural Aizu factory in Japan. With an 86mm accessory thread, and weighing 39.9 oz (1,132g) the new Sigma 85mm F1.4 HSM DG A is larger than most competitors’ lenses, except perhaps the Zeiss Otus equivalent. With an optical construction using no fewer than 14 elements arranged in 12 groups, it’s not difficult to understand why this lens is so large. 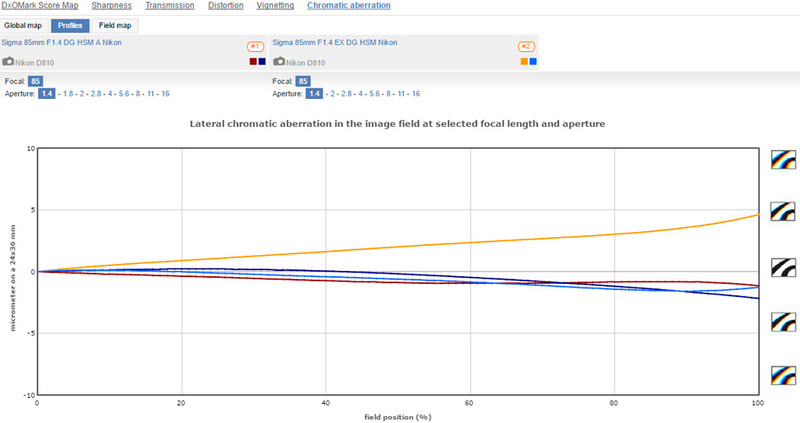 To help reduce chromatic and spherical aberrations, the new model lens features two low-dispersion SLD glass elements and one aspherical lens. The minimum focus distance of 33.3 inches (85 cm) is typical of the focal length. In addition to oil-repellent coatings on the front and rear lenses, the mount features rubber sealing for protection against dust and moisture, though it’s not clear if the lens itself has further sealing. Although we don’t test AF speed, we’re encouraged to hear that Sigma has adopted a newly-developed sonic-type HSM autofocus motor with 1.3x the torque of its predecessor to cope with such a big lens. It also features full-time manual focus override in both single and continuous AF modes, which will find additional favor with back-button AF users. And as with current high-end Nikkor lenses, the Sigma Nikon-mount version reviewed here adopts an electromagnetic diaphragm, offering more stable exposure during continuous bursts or time-lapse sequences. The Sigma has very high and homogenous sharpness, even wide-open, where high-speed lenses like this usually struggle. It reaches peak sharpness between f/2.8 and f/4, though it achieves optimum performance at f/5.6, with levels decreasing slightly on the Nikon D810 as early as f/8 due to diffraction. Distortion is rarely an issue for modern 85mm lenses, and indeed, this lens has none, and it has very low lateral chromatic aberration. The only downside perhaps is some vignetting. Even though it is a relatively low –1.4EV in the corners wide-open, it is noticeable from around the 40% mid-field position. Sigma took its time updating the 85mm F1.4 at least in part because its EX predecessor was already a very good performer. Introduced in 2010 at roughly $969 retail, it was reasonably-priced option given its overall excellent optical quality. Admittedly, the new Art-series lens has far superior sharpness wide open at f/1.4 — and not just in the centers, but across the frame from corner to corner. Even one stop down from the maximum is enough to dramatically improve sharpness in the older EX model, but it’s still not a match for the new lens. Indeed, while the older EX is seriously sharp stopped-down, the new model outshines it at every aperture. Further, large-aperture lenses like this typically suffer from lateral chromatic aberration, but the new model is one of the best-corrected models we’ve seen. 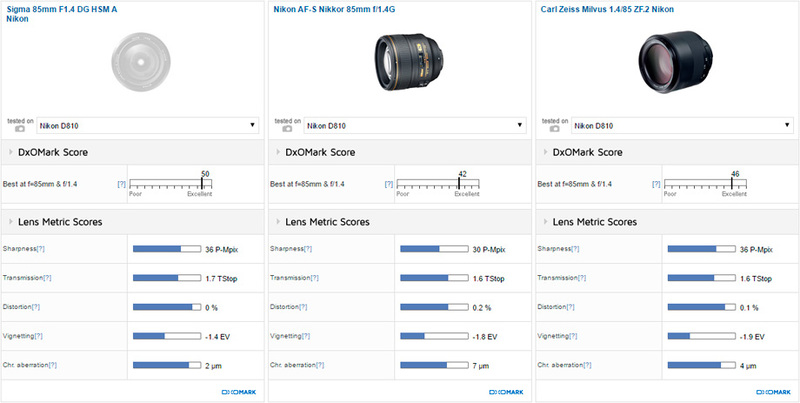 We’ve also compared the new Sigma Nikon-mount model against the AF-S Nikkor 85mm F1.4G. While you might think the $1,199 is a lot for the Sigma, there’s a $1,000 premium for the Nikon glass, a well-known and highly-regarded model that performs well in our tests. We’ve also included the manual-focus-only Zeiss Milvus in our comparison, as it’s aimed at a similar audience. At around $1,800, it’s a more realistic option than the $4,500 Otus equivalent. In our tests, both the Nikkor and the Milvus are sharp wide-open, and continue to improve in sharpness across the field when stopped down. However, the Sigma has the best symmetry of the three, and the Nikon the worst (which never appreciably improves till f/8 and above). This asymmetry may not be much of an issue outside the lab, where it could arguably lend itself to some of the character for which the Nikkor is praised. However, the Nikkor also has higher levels of chromatic aberration than either the Sigma or the Milvus. And while low at 7 microns, it’s still somewhat troublesome in a lens designed for portraits. As for vignetting, despite being slightly more noticeable than with its predecessor, the Sigma has the least visible fall-off of the three. 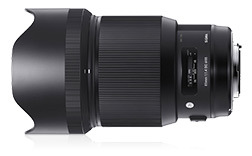 With its Art series, Sigma has done much to improve its standing as a high-end lens maker. Until only recently, Canon and Nikon were on safe ground with their high-speed primes, but makers such as Sigma and Tamron (and Zeiss) are beginning to make inroads. While all the full-frame Art series lenses are excellent performers optically, the latest model in the range is also its best. It also happens to be the most expensive to date, but the $1,199 asking price seems reasonable. That it outperforms the Zeiss Milvus and outrageously expensive Otus equivalents probably says enough for most people — and that’s even before discussing the merits of autofocus versus manual on high-speed lenses like this.